On April 8, I had the great pleasure of participating in a “Medieval Studies Workshop for Secondary Educators” at Fitchburg State University (Fitchburg, Mass.). 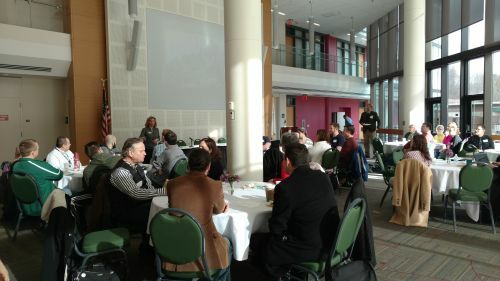 The program was organized by Fitchburg State medievalists Kisha Tracy and Reid Weber and was attended by forty faculty members, secondary-school educators, graduate students, and undergraduates. The goal of the workshop was to present and discuss creative and engaging ideas for making the most of the Massachusetts state guidelines for including the Middle Ages in middle and high school curricula. The day began with a plenary by Amy Appleford (Boston Univ.) on situating medieval asceticism and death practices in London in a modern context. This was followed by a panel discussion on medieval studies in secondary school curricula, with Kisha Tracy (Fitchburg State Univ. ), Brandon Hawk (Rhode Island College), Katherine Seawright (Fitchburg State Univ. ), Reid Weber, Daniel Sarefield (Fitchburg State Univ. ), and myself. The six breakout sessions featured local medievalists presenting creative ways to engage secondary-school students in Medieval Studies: “Manuscripts in a Sea of Data” (Brandon Hawk); “A Knight’s Tale: Arms and Armor” (presented by the Worcester Art Museum, which is home to one of the nation’s finest collections of arms and armor); “Teaching the Middle Ages-Medieval Music” (Kathleen Sewright); “Teaching with Medieval Film” (John Sexton (Bridgewater State Univ.) and Kisha Tracy); “Castles and Siege: Design and Mathematics” (Reid Weber and Jenn Berg (Mathematics, Fitchburg State Univ.) (this session featured a math lesson using trebuchets); and “From Caves to Cathedrals: A History of Russian Icons” (presented by the Museum of Russian Icons). The breakout sessions were lively and engaging, and all of the educators came away inspired. My participation in the morning’s panel discussion presented an opportunity for me to reflect on the Medieval Academy’s ongoing efforts in this arena, initiated last year by our former President, Barbara Newman. The Academy’s ad hoc Committee on K-12 Engagement will soon become a permanent committee, and our efforts are just getting started. At February’s Annual Meeting, the Committee (chaired by Tom Burman (Univ. of Tennessee, Knoxville)) sponsored a very lively panel attended by a dozen Boston-area secondary-school educators, all of whom attended the conference at no charge. As at the Fitchburg symposium, the panel addressed both the problems and the opportunities presented by the oft-underwhelming state and federal standards for Medieval Studies. As our efforts move forward, we hope to find ways to advocate at the state and federal levels for improved representation of the medieval. One way to get the ball rolling is through local initiatives such as the Fitchburg symposium. Professional development points are a key component for K-12 educators who attend such programs; standards for PDPs vary from state to state, so be sure to check your local Department of Education website for information about accreditation. At Fitchburg, the University’s Center for Professional Studies played a major role in securing the state accreditation needed for granting professional development credit to the teachers who attended the workshop. If you are interested in organizing a similar event, please feel free to contact Kisha Tracy and/or Reid Weber, the primary organizers of the Fitchburg State symposium.